It is my privilege to announce that Love God Greatly will be hosting our first ever one-day women’s conference in Dundonald, Ireland this coming March! 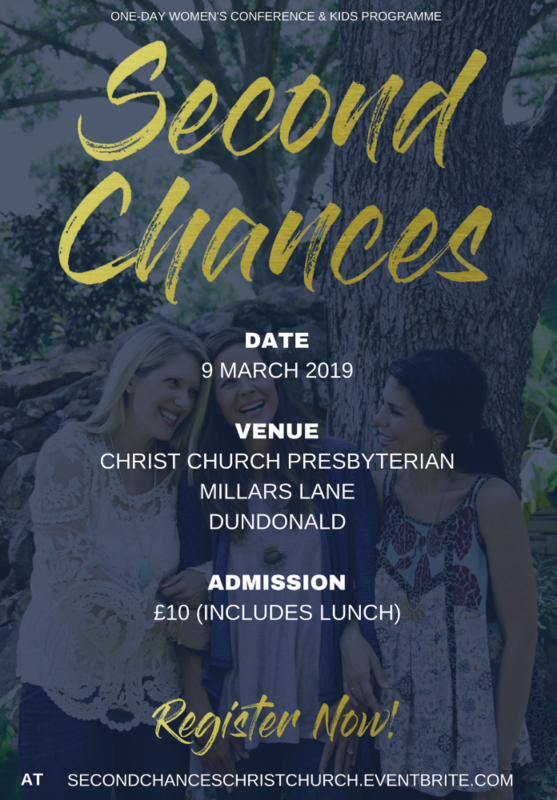 The conference will take place at the Christ Church Presbyterian in Dundonald on Saturday 9th March and our topic for the day will be Second Chances. We will explore the character of God, His grace which offers us endless second chances, and altogether enjoy a day of rest, encouragement & spiritual refreshment. Not only are we hosting a women’s conference, but we are also running a Kids’ Programme at a nearby venue for those who would like to bring their children. You can find out more and register your children at the link above. This will be a great day for all kids involved!! I would personally love to invite you to come and join us for this special event day! Whether you have been around Love God Greatly for years or are new to LGG, whether you’re a believer of many years or new in your faith, YOU are welcome!!! I am so excited to have LGG come to encourage & inspire women in Northern Ireland and I don’t want you and your friends to miss it! Little did I know as I began translating Love God Greatly resources many years ago into the Czech language (My home country), that I would one-day host a conference like this! I’m originally from the Czech Republic but now live in Northern Ireland, where my husband is from. He is a full-time youth pastor and together we serve at our local church. I can’t wait to be able to serve even more women and their children in my town by providing an opportunity like this for them to be encouraged and know that they are loved! If you or a friend lives in Ireland, please share our upcoming conference with them! Help us get the word out to all of Ireland!! !